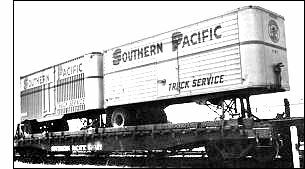 In the early days of TOFC (trailers on flat cars), pairs of 30-foot trailers were loaded onto 60-foot flat cars, which places Roco's model in the 1940s. Many railroads ran "piggyback" service, so it's possible most of the roads listed below had them—except for Penn Central. The PC was born in the 70s, after 30-foot trailers had all but disappeared, although it's possible they might have inherited some of the old PS-4 flat cars and repurposed them. The 1968 catalog lists a Canadian National piggyback but shows a Canadian Pacific. Since the photo has obviously been touched up, it's hard to say what's right and what's not, and since it appears the product may not have been released, we may never know.